India's economic growth in the January-March quarter at 4.8 per cent is disappointing but that is not a surprise. If the BSE Sensex plunged 455 points on Friday, the reason lay elsewhere. What hit the investor sentiment the most was the statement made by Duvvuri Subbarao, Governor of the Reserve Bank of India, in Ahmedbad on Thursday that the RBI was still concerned about the country's wide current account deficit and still-high rate of retail inflation. Aruna Roy, a major voice in the National Advisory Council (NAC) on crucial social and welfare programmes such as for rural employment guarantee, right to information and food security, has decided not to continue with her membership of the non-constitutional body after her current term ends on May 31. The fight for the rights of Dalits in India began much before the nation gained freedom. Therefore, it's indeed ironic that even after 65 years of Independence, discrimination against Dalits continues. What else can explain it better than the incident in which a Dalit groom had to take his barat under police protection? The UPA’s ninth year report card presented last week makes sober reading. There have been scams galore, poorly handled, with efforts to cover up and remedial action in slow motion. Yet, despite obvious rift and indecision, there have been some modest achievements to boot. My uncle Satyavir Sirohi came from the Jatland of Uttar Padesh. I stayed with him for about a year in 1968. He always remained a man known for being a strict martinet. All his commands were diktats smacking of an attendant authority exercised over us, the kids in the house. He was also feared like anything and doubly for his being a cop. Even while having fun during vacations, my Buaji used to caution us on his arrival to ‘be serious now’ since the ‘dictator’ had arrived home. Boy meets girl. They are like chalk and cheese. And even though they are so different tum galat nahi par mujh se bahut alag ho… sparks fly. Love follows, remains one-sided for eight years… to finally arrive at the 'happily ever after' end. if you've seen the original Hangover relish the flavour, sequels are after all sequels and Hangover Part III is particularly lackluster. When irreverence becomes the name of the game the effect is dulling. India's economic growth in the January-March quarter at 4.8 per cent is disappointing but that is not a surprise. If the BSE Sensex plunged 455 points on Friday, the reason lay elsewhere. What hit the investor sentiment the most was the statement made by Duvvuri Subbarao, Governor of the Reserve Bank of India, in Ahmedbad on Thursday that the RBI was still concerned about the country's wide current account deficit and still-high rate of retail inflation. This has been seen as a signal that there may not be any chances of the apex bank lowering interest rates to boost economic growth during the monetary policy review at its meeting on June 17. Silence is an option the RBI chief should consider seriously. Recently he did cut the repo rate but spoiled the party by sounding hawkish on inflation. The latest economic data did show positive signals but these were broadly ignored. India's fiscal deficit for 2012-13 narrowed to 4.9 per cent of the GDP, which is lower than the official target of 5.2 per cent. What is worrying is the current account deficit, which has ballooned to 5 per cent of the GDP from 4.2 per cent in the previous year. This is because the imports of oil and gold are rising and the exports are sluggish due to a weak global economy. A fall in the gold and oil prices has brought a big relief for the government's tight finances, but lower prices have led to a surge in the domestic demand for gold, negating the benefits expected. Though the oil prices are down, the wide current account deficit has weakened the rupee against the dollar. This, in turn, has made India's oil imports costlier. The depreciation of the rupee has also raised the cost of Indians going abroad for study, business or holidays. On the whole, there is a broader agreement among experts that the worst is over for India's economy and that growth will pick up as interest rates come down later in the year. Aruna Roy, a major voice in the National Advisory Council (NAC) on crucial social and welfare programmes such as for rural employment guarantee, right to information and food security, has decided not to continue with her membership of the non-constitutional body after her current term ends on May 31. She has criticised the government, Parliament and the 'system' for not paying sufficient attention to issues of the large mass of poor people. The immediate trigger for the outburst was the government not agreeing to pay the 'minimum wages' under the MGNREGA, and its inability to push through the food security Bill. The exit of the much-celebrated civil society and public cause activist is an embarrassment for the government as well as the NAC. However, she has praise for the pre-legislative consultation process that the NAC has facilitated, giving voice to a broader spectrum of stakeholders. Her statement that she is leaving because the NAC took up too much of her time - which she wants to use for more pressing concerns - may hold some water too, as in most states the wage under the MGNREGA happens to be the same as minimum wage. The government has already linked the MGNREGA wages to the price index for agricultural workers. The job guarantee scheme has earlier come under criticism from the CAG for not being cost-effective in the works that are executed under it. Roy wants higher wages to be paid under it. While these are two opposing expectations from the same scheme - and neither is devoid of reason - it would do justice to bear in mind the primary goal of the scheme. As opposed to a typical employment situation, where some work needs to be done and labour is hired to do it, under the MGNREGA work is created where none exists with the purpose of giving sustenance to the worker. It should thus be treated as a stopgap arrangement till a person finds regular employment. If job guarantee close to home becomes too lucrative, it can become a disincentive to acquiring skills or seeking a regular job. The fight for the rights of Dalits in India began much before the nation gained freedom. Therefore, it's indeed ironic that even after 65 years of Independence, discrimination against Dalits continues. What else can explain it better than the incident in which a Dalit groom had to take his barat under police protection? In Barwas village in Bundi district of Rajasthan, some members of a high caste community allegedly forbade a Dalit bridegroom from undertaking ghurchari, a simple auspicious ceremony of marriage procession. Fortunately, the police not only provided protection but also registered cases against those who threatened the Dalit groom. However, it's not always the case. Often Dalits end up paying a heavy price for the centuries old caste system that continues to hold a vice-like grip on various communities of India. If a decade ago a young boy was killed for plucking flowers, in yet another incident a Dalit teenager was beaten to death for daring to write a poem to an upper caste girl. Not surprising, inter-caste marriages involving a Dalit sometimes have a violent end. A study on Gujarat reported 98 forms of discrimination and brought out many damning facts. Indeed, it's nobody's case that in modern India Dalits remain exactly where they were centuries ago. Their emergence on the political scene in the last two decades does indicate a significant shift in their status. Besides, the social relationship that they share with non-Dalits too has evolved for the better. Still, caste-based prejudices run deep and manifest in many ways, invariably virulent too. Dalit movements and affirmative action as enshrined in the Constitution might have led to some path-breaking changes, it still has not brought Dalits on an equal footing. It is indeed dangerous that in independent India there are many who continue to believe that certain privileges can be exclusive to upper caste members. The government needs to nip such attitudes in the bud and with an iron hand. The agenda now must be not to coast along but to go full steam ahead in the time remaining before the polls to undertake systemic and structural reform. No doubt, the Opposition has played a negative and even destructive role in not permitting Parliament to function — an unpardonable sin. But let the government throw down the gauntlet and challenge the Opposition to oppose and delay the overdue reforms it has been screaming for and which the country so urgently needs. A real effort to move forward would be the Congress’s best electoral plank and would place the onus on the BJP, the Left and others to explain to the “aam admi” why they have stymied progress, growth and employment. That the government can stand its ground and take farsighted decisions was proven by the way it handled the Chinese intrusion into the Depsang plain without getting rattled or pushed by chauvinistic clamour. At the end of the day, the Chinese blinked and pulled back. That the joint statement issued later did not mention the word “intrusion” — the PM used the phrase “incident” — signified a welcome restraint and desire to avoid teasing statements. The special representatives of the two sides will now meet to settle the boundary question. As previously agued, India has no reason to yield any ground in Arunachal, barring some minor adjustments along the current LAC, and certainly not give up any populated areas as previously agreed, like Tawang. The Chinese cannot say and unsay things at will. But in the Western sector, India will have to abandon its tenuous claims to Aksai Chin. It was prudent to prevent Tibetan demonstrators from staging an incident that would have been a needless provocation to the Chinese. The lack of reference to Tibet in the joint statement, however, signified nothing. The objective of the meeting was to pave the way for a resolution of current irritants rather than to provoke. Nonetheless, India has a right to be concerned about developments in Tibet. We do not stand for an independent Tibet. Nor does the Dalai Lama, who has time and again taken his stand on the autonomy promised under the 17-Point Agreement with China in 1951. Failure to implement this led the young Dalai Lama to take the opportunity of his visit to India in 1956 on the occasion of the 2500th nirvana of the Buddha to remain in this country. This greatly embarrassed the Chinese and when Chou En-lai visited India (twice) during that year, he pleaded with Nehru to prevail on the Dalai Lama to return home on the basis of solemn assurances that the 17-Point Agreement would be faithfully implemented. It was on Nehru’s conveyance of these reassurances and his own quiet persuasion that the Dalai Lama returned to Lhasa. Hence India has some locus standi in asking why that promise of autonomy has been denied. The Indian and Chinese Prime Ministers discussed trade and water issues. Balanced trade, market access and more investments are in order. But there were signs of overreaction in India’s concerns about water use and diversion in Tibet. Seeking fuller, real time water discharge data from Tibet is legitimate. But questioning all Chinese run-of-the-river or even storage projects in Tibet is to cry wolf. The upper riparian has certain rights, as India asserts on its international waters. Fears of Chinese “diversion” north of the Tsang-po/Yaralangpo/Dihang (mistakenly called the Brahmaputra) are exaggerated. Nonetheless, the smart thing for India to do would be to solicit Chinese cooperation, along with other co-riparians, the Japanese, ESCAP and ADB, in a joint techno-economic feasibility study on tapping the huge hydro-potential of the Tsang-po U-Bend as it cascades 8000 feet from Tibet to India. A desktop study of this by the Japanese in the late 1980s indicated a 48-54,000 MW potential depending on the alignment of a proposed tunnel from Tibet to India. The power generated in India at the foot of the drop could be fed into a SAARC-ASEAN-China energy grid and would do much to pre-empt the burning of several hundred million tonnes of dirty coal and earn credit under the clean development mechanism. A Canadian scholar has suggested that rather than build a dam at the head of the U-Bend, it would be simpler to straddle the gorge with an inflatable polythene sausage dam that would be both more economical and ecologically benign. The Chinese may reject a joint U-Bend development proposition. But India would have staked a claim to the energy of this shared drop. Meanwhile, the formation of a new government in Pakistan is awaited under Nawaz Sharif, hopefully with support from Imran Khan’s party. Sharif has made all the right noises about India but is prudently trying to take the Army on board and rein in the jihadis. One has to see how things pan out but here is an opportunity for a real new beginning that India must not miss. Manmohan Singh has made the right responses and should visit Pakistan at the earliest in order to consolidate the positive trends and demonstrate that India is not the permanent enemy of Pakistani ideologues’ fevered imagination. Hawks and right wing ideologues in India could be spoilers. Consultations with them are most desirable. An internal back channel seems indicated here as much as revival of the Indo-Pakistan back channel. The United Jihad Council chief, Salahuddin, has warned Nawaz Sharif against coming to terms with India. These are internal obstacles that Sharif will need to confront. But India should not falter. At home, the IPL-BCCI scandal is a disgrace to the game, an enthusiastic and trusting public and to India’s image. Sport has been invaded by commerce on an obscene scale and taken over by dirty money and dubious characters if not outright criminals. There has to be a thorough cleansing of the Augean stables. Our punishments are far too mild and delayed and have little deterrent effect. All this must change. All this was as if taken by us in our stride, but my uncle’s total dislike for films and actors affected us the most. He liked films based only on the life of dacoits, or any of Rajendra Kumar, Ashok Kumar and Dilip Kumar movies. The rest of them, all for him, were ‘bhaands’ — street jesters, who ‘deserved to be put inside jail under 109 — a section described in the Criminal Procedure Code. One fine day it so happened that uncle called us to him and handed over a five-rupee note saying all three of us could watch ‘Upkar’ in Race Course Cinema. It was no less than a shocker. Was he playing a prank? Were we in for a trap? Was he trying to employ a ploy to seek information if we watched movies at his back? Was he being clever by half and trying techniques of time-tested variety on us being a cop? All these and many more apprehensions came to our mind and we out of a collective reflex just smiled at his offer. I recall our smile had turned into a grin to please him for we thought it would. Lo and behold! He said he was serious. We didn’t know how to react but feigning ‘not much interested’, we grabbed the note and the occasion. Excited as we were, we had a double-‘maza’ of watching Manoj Kumar, Asha Parekh, Pran and Prem Chopra in a much relaxed manner. We did not then bother for the prying eyes of some acquaintances, who could report it to uncle of our acts of desperado, in as much as watching movies was concerned. Uncle retired as a senior police officer while both his sons are Brigadiers in the Indian Army. We came to know, however, that uncle too was a keen watcher of movies – while being away from us. Now as a theme this one has been tried and tested before often with spectacular results. So as far as subjects go Yeh Jawani Hai Deewani isn't treading a path breaking ground. Yet it's not on a shaky ground either. Lavishly put up in trademark Karan Johar style who by the way is only the producer here (so an opulent wedding is not far behind), this is a directorial signature by Ayan Mukherji (remember Wakeup Sid also starring Ranbir Kapoor?). Certainly it may not be the mother of all romances but also isn't a typical romcom either. Even though here's a love story, the kinds you have seen before in recent times as contemporary urban setting has become the new toast of Bollywood. Indeed, at one level the film celebrates friendship more than love. The bonhomie between the three bosom pals (Ranbir Kapoor, Kalki Koechlin and Aditya Roy Kapur) joined by the fourth one (Deepika Padukone) is as if not more infectious than the romantic angle. Love is in the air (there is a hint of romance between Kalki and Aditya too) but stronger is the bond between friends which knows no gender. That Ayan has his hand on the pulse of the youth there can be little doubt. So dialogues are natural in sync with how Gen Next thinks and behaves. Actually there is little in the movie that is contrived or laboured. Be it Ranbir's relationship with his father (Farooq Sheikh in a small but impressive cameo) or Deepika's with her mother (Dolly Tewari makes a brief appearance) the film not only has a heart but also tries to be soulful, a mission in which it succeeds only in bits and parts. Of course, it rides primarily on Ranbir's popularity as well as talent and circles mainly around him. Not to say that Deepika has a lesser part. But it's his dreams and ambitions that are of any consequence here. He is as always eye candy and a brilliant dancer that he is, matches step with step with the diva Madhuri Dixit who makes a striking presence in an item song. In the song Ghagra she once again proves what made her the dhak dhak girl. Songs, be it Badtameez Dil or Ghagra or Balam Peechkari Jo Tunay Mujhe Maari, are exceptionally well choreographed and make up for other fault-lines. Foot-tapping music by Pritam is clearly the USP of the film. Indeed, the film has energy and verve but its pace is not always consistent. Performances, however, are. Deepika as the oddball chasmish (studious girl with spectacles) who turns into a glamour puss eight years later might be revealing a bit more than required (even in traditional attire) she imbues her role with sufficient substance and poise. Without a doubt she and Ranbir make for a hot jodi. The presence of satellite stars is not wasted either. Kalki impresses as the unconventional madcap girl who finally settles for an arranged match. So does Aditya Roy Kapur, once again playing an alcoholic brooder as he did in his ticket to stardom Aashiqui 2. But the surprise package is Kunal Roy Kapur. As the fawning beau of Kalki, he is delightfully awkward. If the film is largely gloss and shine it also tries to pack some meaning evident in one-liners like zindagi mein kuch na kuch chodna padta hai. In short, life is all about making choices. The choice to watch it or not…. certainly with so much hype around the film, no way are you going to miss it. Our advice —don't go with great expectations and you will be able to overlook minor blemishes that among other things also includes the long length of nearly two hours and forty minutes. Or else, imagine Alan Garner (Zach Galifiankis), the head joker, driving on the highway with a giraffe in tow, smiling broadly till the giraffe is beheaded as it hits a bridge. 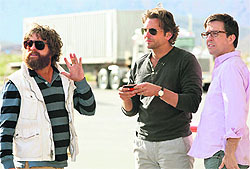 The 42-year-old is off medication and needs "intervention" and his wolf-pack of relatives Phil (Bradley Cooper) Stuey (Ed Helms) and Doug (Justin Bratha) are assigned the job. But halfway to the locale Arizona, Alan decides he just won't go. So, more trouble. Meanwhile, Leslie Chow (Ken Jeong), one of their gang has decamped with the moolah (read gold bars) and Marshall (John Goodman) is not on his heels. So, Phil and Co have their hands full running from pillar to post. Stuey probably has the best lines (and expressions to match). They trace Chow but he is too clever for the wolf pack. In between Jade (Heather Graham) makes a brief appearance but the poor Oscar winner in just wasted. Director Todd Phillips has a big canvas but it is full of inanities. If one has to look for plus points, cinematographer Lawrence Sher freaks out on the aerial shots of Las Vegas with all its neon lights. Bradley Cooper is his usual competent self and Ed Helms not far behind. Zack Galiafiankis is inconsistent while Ken Jeong is more or less academic. The best part is that it is only 100 minutes long. Watch it at your own risk. Eternal Sunshine of the Spotless Mind is a 2004 American romantic science fiction film about an estranged couple who have each other erased from their memories. The film uses elements of science fiction, psychological thriller and a nonlinear narrative to explore the nature of memory and romantic love. The film stars Jim Carrey, Kate Winslet, Kirsten Dunst and David Cross. Love Aaj Kal is a 2009 film that stars Saif Ali Khan, Deepika Padukone, Rahul Khanna, Rishi Kapoor and Giselli Monteiro. It is directed by Imtiaz Ali. The film portrays the feeling of pure love which never changes over time, although the perspective of realising one's soul mate has changed over time.